You can read all the alcoholism facts you want out on the Web. Just do some surfing and you'll find enough information about alcoholism to make your head swim! You can go this website, for instance, and read lots of alcoholism facts. The purpose of my website is not to wow you with medical and psychological information about alcoholism. I'll leave that to the experts. Wait a minute! I am the expert. I lived this stuff. Who better to relate facts and information about alcoholism than an alcoholic herself?? One of the first alcoholism facts from my perspective is that it is a hereditary disease. I am convinced of this based on my own family history. Please see my page on Genetics and Alcoholism. Like myself, some people just seem to be genetically susceptible and are "hooked" from the beginning. There are others who may abuse alcohol intermittently for years before crossing the line to dependency. Not only that, we alcoholics are more than likely suffering from some sort of emotional pain (whether we know and/or admit it or not). Drinking also deadens the emotional pain - and incidentally, any physical pain as well! Another fact: At some point, the alcoholic's life begins to crumble. As it says in that First Step, our lives become unmanageable. So the emotional pain escalates. Our problems stack up on us and seem impossible to solve. What we often can't see is that the pain and the difficulties are the results of our drinking. We blame everything and everyone BUT the alcohol. So we drink more in a effort to numb the pain. What a vicious cycle it is. 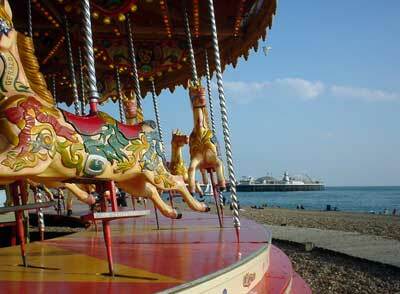 We can't seem to get off the merry-go-round. How Can A Detoxification Kit Help You? The obvious alcoholism facts, now that I am living in recovery and reality, are many. Take this one, for instance: We usually aren't able or aren't willing to recognize that drinking is the reason for our pain. It's the boss, the spouse, the children, the parents, the finances, the past . . . Darn the bad luck. Life just isn't going the way we planned. Before my recovery, my personal circumstances stood somewhere between dreadful and catastrophic. I truly thought that if I could just get these people and circumstances straightened out, my life would be so much improved. "Yeah, I drink. And I'll continue to drink, thank you very much... THAT's not the issue." Aaaah, but it WAS the issue. Until I was willing to examine my powerlessness over alcohol and the unmanageability of my life because of my drinking, there was little hope for things to improve. Another alcoholism fact: IT GETS WORSE,NEVER BETTER. Alcoholism is a progressive disease. When I look over the course of my life and all the drinking that I did, it is clear to me that I went through the predictable stages of alcoholism. Remember: Rarely can we alcoholics recover on our own. Gone are the days (like in my alcoholic parent's and grandparent's day) when it was taboo to even mention a problem with alcoholism, let alone go for help. Programs like Celebrate Recovery, Alcoholics Anonymous, and so many reputable Alcohol Rehab Centers are available. It is a new era, one with many opportunities for hope and full recovery from this disease. Thank God! These are just a few personal observations from my own life of alcoholism - a life out of control. Please click below to read more facts about alcoholism. READ MORE: Is Alcoholism a Disease?